It's frustrating when you get an error after sending an email message. This topic describes what you can do if you see error codes 550 5.1.1 through 5.1.20 in a non-delivery report (also known as an NDR, bounce message, delivery status notification, or DSN). I got this bounce message. How do I fix it? I'm an email admin. What can I do to fix this? Here are some steps that you can try to fix the problem yourself. If the steps in this section don't fix the problem for you, contact your email admin and refer them to the information in this topic so they can try to resolve the issue for you. It sounds too simple, but the wrong email address is the most common issue that causes 5.1.x errors. Check for correct spelling and send the message again if you find an error in the email address. 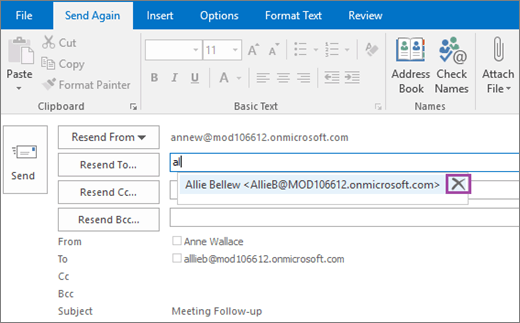 To resend the message in Outlook, see Resend an email message. You might have an invalid entry in your Auto-Complete list (also known as the nickname cache) for the recipient. For example, the recipient might have been moved from an on-premises Exchange organization to Exchange Online, or vice-versa. Although the recipient's email address is the same, other internal identifiers for the recipient might have changed, thus breaking your cached entry for the recipient. To remove invalid recipients or all recipients from your Auto-Complete list in Outlook 2010 later, see Manage suggested recipients in the To, Cc, and Bcc boxes with Auto-Complete. In Outlook on the web, click New mail. Start typing the recipient's name or email address in the To field until the recipient appears in the drop-down list. Use the Down Arrow and Up Arrow keys to select the recipient, and then press the Delete key. Open the mailbox in an older web browser that only supports the light version of Outlook on the web (for example, Internet Explorer 9). In Outlook on the web, click Settings . In the Search all settings box, type light and select Outlook on the web version in the results. In the page that opens, select Use the light version of Outlook on the web, and then click Save. Log off, close your web browser, and open the mailbox again in Outlook on the web. Choose Options and verify that Messaging is selected. In the E-Mail Name Resolution section, click Clear Most Recent Recipients list, and then click OK in the confirmation dialog box. While you're still in Options, to return your mailbox to the full version of Outlook on the web, go to Outlook version, clear the check box for Use the light version, and then click Save. Log off and close your web browser. The next time you open your mailbox in a supported web browser, you'll use the full version of Outlook on the web. Does the recipient's email address in your original message exactly match the recipient's email address in the NDR? Compare the recipient's email address in the NDR with the recipient's email address in the message in your Sent Items folder. If the addresses don't match, contact the recipient (by phone, in person, etc.) and ask them if they've configured an email rule that forwards incoming email messages from you to another destination. Their rule could have tried to send a copy of your message to a bad email address. If the recipient has such a rule, they'll need to correct the destination email address or remove the rule in order to prevent 5.1.x message delivery errors. Did you send the original message at all? If not, it's possible that a spammer or hacker inappropriately used your account to send the message. Check your recent messages in the Sent Items folder for strange or unknown messages (messages that you didn't send). If you find any, it's possible that your email account was compromised. Reset your password and scan your devices for malware. However, the hacker might have configured other settings on your mailbox (for example, created Inbox rules to auto-forward email messages or added additional mailbox delegates). So, follow the additional steps in How to determine whether your Office 365 account has been compromised. Notify your email admin. Your admin will need to unblock your account before you can send email again. If your Sent folder contains only messages that you know you sent, then the NDR you received could be a result of backscatter (a useless NDR about a message you didn't send), and you can ignore it. Typically, if a message can't be delivered, the recipient's email system will use the sender's email address in the From field to notify the sender in an NDR like this one. But what if the message was sent by a spammer who falsified the From address so it appears the message came from your email address? The resulting NDR that you'll receive is useless because it creates the false impression that you did something wrong. This type of useless NDR is called backscatter. It's annoying, but if this NDR is backscatter, your account hasn't been compromised. Check your recent messages in the Sent Items folder for strange or unknown messages (messages that you didn't send). If you don't see any suspicious messages, it's likely that the NDR you received is backscatter. If you've already changed your password and run an anti-malware scan, you can ignore these backscatter NDRs. To learn more, see Backscatter messages and EOP. I'm an email admin. What can I do to fix this? If the steps in the previous section don't solve the issue for the sender, the solution might be related to the way the user's Office 365 account is set up. If you have a hybrid topology, the solution might also be related to the on-premises mail transfer agent. It might also be a problem with the recipient's domain configuration. Here are 4 solutions you can try. You might not need to try all of them to get the message sent successfully. For Office 365 accounts, the Office 365 portal provides a central source for a variety of tools, notifications, and information that you can use to troubleshoot this and other issues. Check the Message Center to see if your organization has a known configuration issue. Select Prevent or fix issues, and perform any relevant suggested actions. Check if there's a current service issue in Office 365 affecting the user's account. Choose Service health to see an overview of any issues. Select View all to get more details about all known issues. Check the sender and recipient domains for incorrect or stale mail exchange (MX) resource records by running the Mailflow Troubleshooter tool that is within Office 365. If there's a problem with the recipient's domain, contact the recipient or the recipient's email administrator to let them know about the problem. They'll have to resolve the issue in order to prevent NDR 5.1.x errors. Error code 5.1.1 can be caused by problems with the MX resource record for the recipient's domain. For example, the MX record might point to an old email server, or the MX record might be ambiguous due to a recent configuration change. Updates to a domain's DNS records can take up to 72 hours to propagate to all DNS servers on the Internet. The MX resource record for your domain might be incorrect. The MX record for an Exchange Online domain points to the email server (host) <domain>.mail.protection.outlook.com. Verify that you have only one MX record configured for your Exchange Online domain. We don't support using more than one MX record for domains enrolled in Exchange Online. Test your MX record and your ability to send email from your Exchange Online organization by using the Verify MX Record and Outbound Connector Test at Office 365 > Mail Flow Configuration in the Microsoft Remote Connectivity Analyzer. For more information, see Create DNS records at any DNS hosting provider for Office 365 and Set up SPF in Office 365 to help prevent spoofing. A forwarding Inbox rule or delegate that the recipient configured in their own mailbox. A mail flow rule (also known as a transport rule) configured by an email admin that copies or forwards messages sent to the recipient to another invalid recipient. For more information, see Configure email forwarding for a mailbox. Still need help with error code 5.1.1 to 5.1.20?